"If you can't take time out for a movie once in a while, then why bother?" With a main character named Maiku Hama (Masatoshi Nagase) who lives above a repertory movie house, it's pretty evident even before The Most Terrible Time in My Life starts that we're in noir parody/homage territory. The first film in the "Maiku Hama" trilogy, TMTT is the only one of the three shot in Cinemascope and black and white. It's a mix of goofy humor and straightforward violence, with occasional nods to classic detective/yakuza films. Maiku Hama ("my real name," he informs us more than once) is a private eye with an office on the second floor of Yokohama's Nichigeki Theater, a repertory house playing The Best Years of Our Lives when the movie begins. The credit sequence cleverly has the marquee flip over to reveal the title of our film, which could sum up the experience of several of the characters. Maiku has a rowdy past, having been in reform school at one point, but he is generally a decent guy. His primary motivation is in sending his teen sister Akane (Mika Ohmine) to college. He doesn't sound like the most exciting of people, I'll grant you. His do-gooder persona hides doubts about his true nature; he is repeatedly told that he is only a "stray dog," and such animals never change their true natures. It sounds like a load of rubbish, but Maiku takes it to heart. His case begins when he accidentally gets a finger severed trying to prevent a shooting at a mah jongg parlor. No good deed goes unpunished, and the young man he tried to aid is a Taiwanese waiter, Yang (Yang Hai Ting), who repays Maiku by hiring him to find Yang's older brother. Yang doesn't entirely have honest motives in doing so, but he and Maiku strike up an unlikely friendship, Maiku seeing something of himself in the younger man. 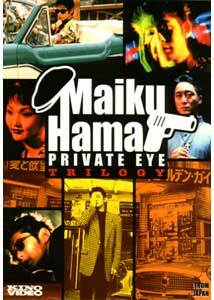 Maiku is pushed around by the two main authority figures in his life, one the cop Nagayama (Akaji Maro) and the other his mentor in detective work, Jo Shishido (played by, well, Jo Shishido) of Seijun Suzuki fame. Both men use physical violence to get Maiku to understand their point, and both also tell him he's not much more than a stray dog. Maiku, late in the film, even wears clothing and a hat similar to Toshiro Mifune in Kurosawa's Stray Dog. Maiku also gets repeatedly beaten up by the gang members whose paths he crosses, although he does dish out some beatdowns of his own. The film wobbles between levity and fairly grim events, which gives the film a schizophrenic quality. Early on, we get scenes like Maiku's friends trying to persuade a dog to cough up Maiku's severed finger and celebrating their success, and later on things turn about 180 degrees the other way, with Maiku put through the wringer, emotionally and physically. The film ends with a sudden burst of color as we're told to await the next installment of the trilogy, with the marquee at the theater now reading the title of the second film, The Stairway to the Distant Past, picking up after the events of TMTT. The film begins with the same basic set-up, as Maiku is dragged into an affair bigger than he expected and scrapes through. After handling a lost dog case and seeing his beloved Nash Metropolitan confiscated by a loan shark, Nagayama railroads Maiku into getting evidence on a riverfront theft ring. At the same time, Kanno, the gang leader of the previous film, is now running for office, and two of his men are trying to muscle in on the riverfront action, run by the mysterious "White Man" (Eiji Okada). One dies nastily, and the other, Yamaguchi (director Shinya Tsukumoto), escapes with an eye burned out, left as an example to others who would try to take over. Maiku manages to narrowly escape capture himself, but his actions cause him to be hunted down throughout Yokohama. Maiku's life is further complicated by the return of his mother, a stripper named Lily (Haruko Wanabuchi), who also has a connection to the White Man, one that will bring he and Maiku into a final showdown, but that won't happen with Kanno and Yamaguchi playing a role. Stairway has a much different feel and look to it, with a couple rather surreal moments thrown in among the beatdowns and stabbings. The lovely black and white photography of the first film, with its extensive use of deep focus, is replaced with color, although much of the film is set at night, dawn, or dusk. As opposed to more straightforward yakuza films, the White Man and his organization are given a nearly mystical power over their turf, and Maiku's eventual trip meet the White Man takes him through a weird, nightmarish landscape. Maiku remains much as he was in the first film, although he rarely takes charge here, and his weakness during the climax is rather pathetic to watch. Having watched these characters through two films, I can't say I really cared all that much what happened to most of them, but the third film, The Trap, still remained. In The Trap, things are looking up for Maiku. Thanks to newspaper coverage of a case he broke, he has more work than he can handle, and on the personal front, Akane is on the verge of entering college, and Maiku has a girlfriend, the cute but mute Yuriko (Yui Natsukawa). But, once again Maiku has a difficult case dropped in his lap. A strange masked figure shows up and asks Maiku to find the masked man himself, dropping a photo in front of him and unmasking to reveal a half deformed face. The masked man is behind a series of murders in the Yokohama area, and Maiku is chosen as the fall guy for the crimes. Yuriko will be dragged into the serial killer's plans as well, and Maiku finds himself hunted by the police when he is framed for the murders. This film had been proclaimed the darkest of the three, and I guess in some respects that's true, but much of it makes absolutely no sense whatsoever. The final twist is completely ridiculous and unbelievable, given what we've been told up to that point, and it feels like a huge cheat on the part of the filmmakers. The film's primary question, as put by one character, is "can we save other people?" and is it worth doing in the first place. A fairly negative question, and the film doesn't appear to have an answer, or if it does, it would be "it depends." So much for that. The performances are again solid, with Nagase at once confident and useless as Maiku. My favorite character, cab driver Hirono (Kiyotaka Nanbara), gets an amusing nod at the end, when the film tacks on a fake ending for a new series of films with Hirono as the main character. Jo Shishido returns as Maiku's mentor, and he has a little more to do this time around, as he musters the private investigators of Yokohama to help Maiku out. Daisuke Tengan, who co-wrote Takashi Miike's grisly Audition, co-wrote this series with director Hayashi, though none of the three approach the Miike film in gore (or quality, for that matter). But Maiku wasn't finished with The Trap. He would return in 2002, in a 12-episode television series and a direct to video movie. The movie, Forest With No Name, was released in the U.S. by Facets Video for those who want to look in again on Maiku. Image Transfer Review: Kino has dropped the ball on the transfers for this set. Or, more to the point, whoever gave them these transfers did, as all three films feature nonanamorphic, albeit letterboxed, transfers. In the case of Most Terrible, this is a real shame, as the Scope ratio and black and white compositions suffer with the lack of enhancement. The transfer is soft and overly grainy. A disappointment. The transfer of The Stairway to the Distant Past fares just as badly if not worse, with dull detail levels and, as many scenes are set in low light or dawn/dusk settings, muddy, hard to see images. The Trap looks a little better, but not by much. Audio Transfer Review: The three films have solid Dolby 2.0 tracks. Everything sounds just fine on these, really. Nothing that is going to wow you or leave you upset. 2 Other Trailer(s) featuring trailers for the other two films in the series. Extras Review: Fairly meagre fare here with trailers, still galleries, and cast/crew bios being about it. Like the movies themselves, the trailers are nonanamorphic. Each disc features trailers for all three films in the trilogy. The cast and crew bios cover the major players in each film, with a screen or two of text and a brief filmography. The Maiku Hama films are decent enough, but nothing that I feel a need to revisit. That they're given subpar, nonanamorphic transfers and no extras of interest only compounds that feeling.